As a rule of thumb, Kiwi blokes don’t really get star struck, even when the inventor of some of the world’s most popular screening and crushing plants turns up for a personal visit. 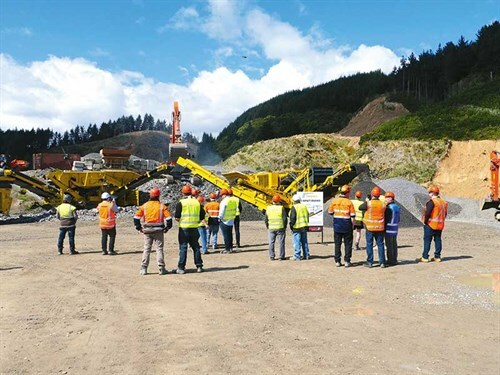 I, for one, didn’t realise we had a ‘celebrity’ in our midst until someone pointed out Kees Hoogendoorn, president of Keestrack group, who had made the trip from Belgium especially for the open day that Keestrack distributors Equip2 had organised at Ohau Quarry in Levin. However, it wasn’t just a day for screening and crushing. 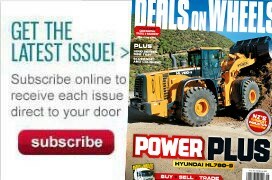 We were also talking Hitachi excavators with CablePrice and Hydrema off-road dump trucks from NZAM, making for a full-on load, cart, and crush event. I attended a similar Equip2 sponsored event around 12 months ago in Wanaka, so was interested in comparing attendance figures and gauging the mood of the visitors. 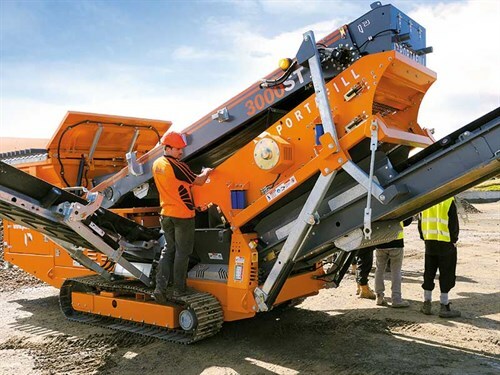 Equip2 had chosen to go all out with the latest showing, demonstrating Keestrack K3, K4, R3, and R5 models, along with a Portafill 3000ST, to what I estimate to be well more than 100 contractors and quarry operators. Kees told me that events such as the Equip2 open day enabled him to speak directly to end users of his company’s products. "We’re a mid-size business, turning over a bit over €100 million per year and sell in 65 countries," he says. Keestrack has three manufacturing operations: Belgium, Italy, and the Czech Republic. "Eight years ago, we started in China for the Asia market because they require a little bit of customised products, and the local building saves build, transport costs, and import duties." Kees says one of the advantages of having a family-owned business such as Equip2 selling his products is that a customer can talk directly to the owner of the company. "I work with my two sons and operate my business a similar way. Anyone can phone up and speak directly to us. It is something that you don’t find much anymore. Most of the manufacturers have been purchased by corporates." "I started the company 30 years ago with my wife with a dream of mobility," Kees says. "Back then, the screening and crushing industry was mainly static or on wheels." 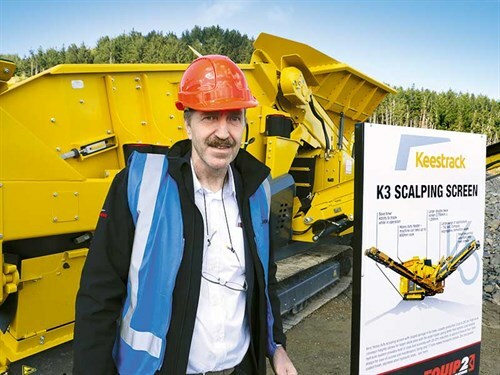 According to Kees, his business was the first to manufacture scalping plant on tracks, and they were the inventors of the plate apron direct feeder. "That gave us a very good start in the business and global coverage," he says. The last 10 years of development for Keestrack have been more in the impact crushers, as an alternative to the traditionally used jaw and cone crushers in quarries. "In the old days, the impactor was more of a secondary crusher. We have beefed up the rotors, the aprons, and the whole impactor, and designed it now to handle straight feed, so you can do it with one impactor instead of a jaw and cone." Kees says their system saves cost and complexity. "It produces a better cubical product for better compaction in the road," he says. "It’s what we stand for." 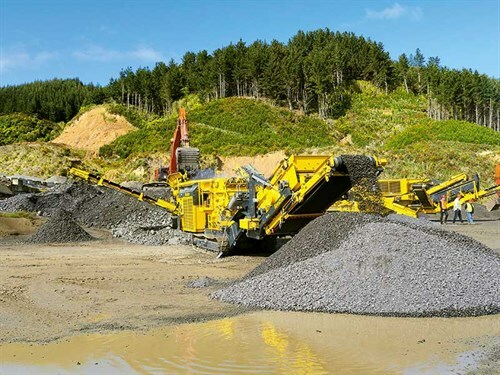 One long-established quarry operator I spoke to said that if he were setting up his quarry again, he would be investing in mobile crushing and screening equipment, commenting that the Keestrack machinery provided a technological step ahead for the industry. 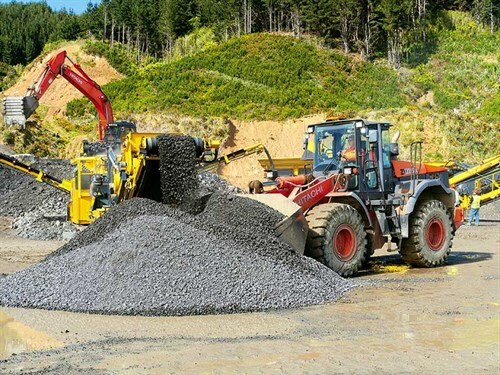 Another operator from the South Island told me that his business had purchased an impactor/screening plant from Equip2 a little over 12 months ago and was looking to add a second unit to keep on top of demand. Equip2’s open day also gave visitors the opportunity to see CablePrice’s latest Hitachi ZX210LB-5B, which is due for release in the early New Year. One of the standout points of the machine is it’s supplied with a factory-fitted telemetry system and aligns Hitachi with competitor brand offerings. 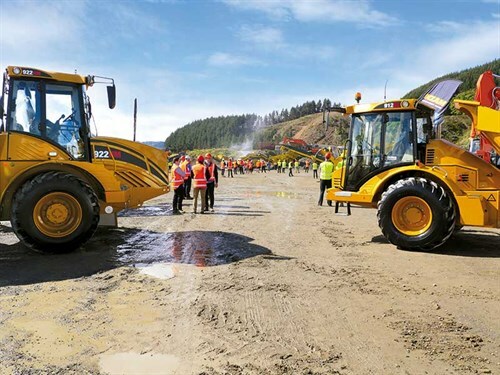 NZAM’s Hydrema dumpers also saw a number of interested parties taking time to inspect the six-wheel drive 922M and the smaller 912ES model. One contractor was pushing NZAM hard for a ‘show special’ deal, showing his seriousness by bringing a transporter to take his intended purchase back to Auckland. Equip2’s ‘build it and they will come’ attitude certainly prevailed during the event, with enthusiastic visitor attendance and quality sales leads for the participating businesses.